To put you at ease you will have a brief chat with one of our hair loss consultants about your lifestyle and hair loss requirements. We will then show you what we can do and with our help, guide you to make the right choice that is suitable for you. If you decide to order one of our bespoke wigs or hairpieces we will take your exact head measurements to create the perfect foundation/base for you. With our made-to-measure pieces you can choose the type of hair, length, colour, texture and curl of your personal preference. We will advise you on prices, programmes and interest free payment methods suitable for you. We recommend you book a consultation to avoid disappointment by calling us on 0207 243 1451. 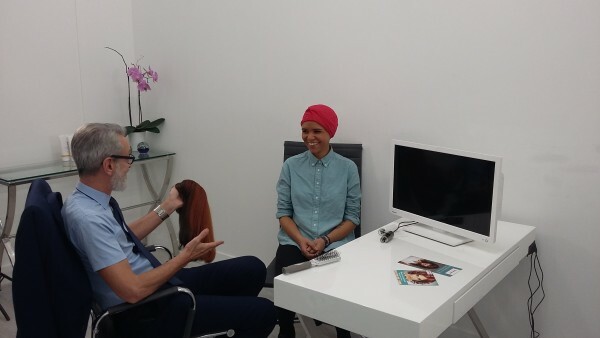 Treatment programmes & products – We offer a range of different treatment programmes to address any scalp or hair condition currently making you feel uncomfortable or unhappy. Treatments are tailored and carried out at the salon which can be continued at home with our home care salon range.